Invacare have created a simple, quality designed power chair with high performance and incredible manoeuvrability. 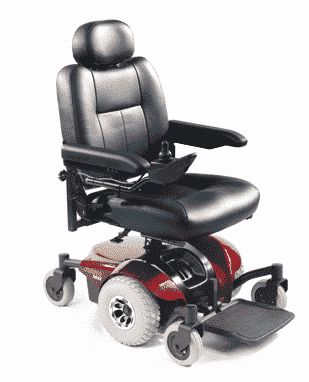 The Pronto M41 powerchair is the perfect balance between style and practicality. The small turning radius means it is ideal for navigating around those tight spaces. Being highly adjustable and having features such as mid wheel drive and SureStep, the Pronto M41 powerchair is perfect for those that need a powerchair for indoor use that can be completely configured to their individual needs. The Pronto M41 powerchair achieves superior stability and manoeuvrability by featuring the latest technology in both in-line motors and electronics. Mid-wheel drive makes the pronto M41 agile and manoeuvrable, being able to turn on the spot it can weave in and out of furniture and obstacles in the home with ease. Combined with its narrow width the Pronto M41 is the ideal powerchair for indoor users. 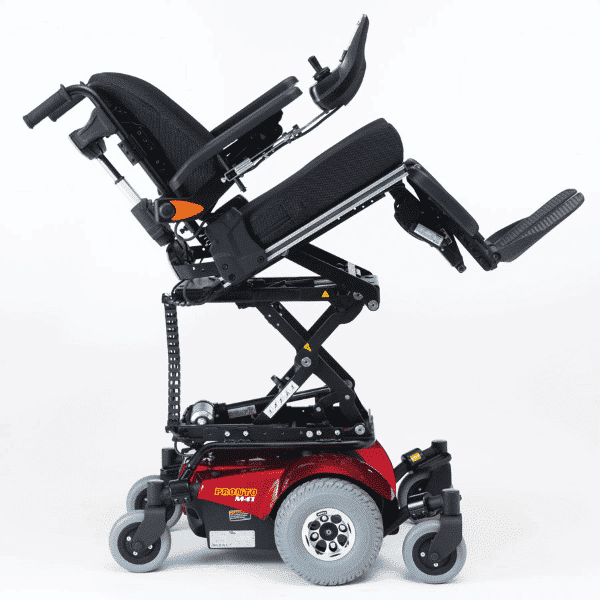 For individuals with limited dexterity the chair on the Pronto M41 has a 90-degree swivel, meaning getting on and off the chair can be safe and easy. SureStep suspension means 6 wheels are kept on the ground at all times. This provides an unchallenged amount of stability without losing speed. Along with creating one of the most comfortable drives in today’s market. Having a massive 21.4 stone weight capacity the Pronto M41 can carry the user up to 17 miles before a recharge is needed. Perfect for people who are on the move most of the day and haven’t got time to recharge. There is a range of seating available; the standard captains seat, the tension adjustable back or Invacares’ own configurable modulate range. The tension adjustable back seat is suited to those with postural problems it can be adjusted from -10 to 30 degrees so you can be comfortable in your power chair. Modulite seating can be fitted, offering a range of powered options, making the powerchair fully customisable and adjustable so you can lift, tilt and recline the chair to your perfect positioning. The new Pronto M41 power chair from Invacare is an easy to use, versatile high-end power chair aimed for indoor use. With its sleek design and high quality build the pronto M41 powerchair will get you to your destination and back safely and in comfort. Wheelchair Weight: With U1 batteries: 161 lbs.Without batteries: 110 lbs. Wheelchair Weight Capacity: 300 lbs. For more information about Invacare M41 or any other powerchair you may be interested in please contact us or call into one of our showrooms across Essex to find out more from our friendly and trained staff at Easy Mobility Services.